Originally exhibited at Moss Outdoor, Santa Fe NM, September 2008. While working at Onorato Home in Santa Fe, David Cole sold many of Denyse’s Couture and Works quilts. When he and Gloria Moss opened Moss Outdoor in the Railyard District of Santa Fe, David invited Denyse to exhibit her quilts at their beautiful new showroom. Over several enjoyable phone conversations, it was decided that Denyse would design a new Works Collection quilt exclusively for the showroom, as well as two Couture quilts that would be the centerpiece of the installation. The Couture designs, One Big Square and Three Isolated Patches, developed from sketches and concepts Denyse created a few years earlier, but never had the time to explore. 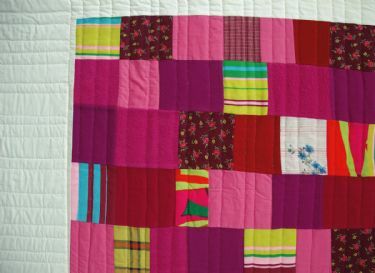 Many of the intensely-hued vintage wools and cottons used in the quilts were many purchased from a Bridgeport fabric store that was closing. Denyse designed 4 Crosses, inspired by a cross shape prevalent in the southwest, in three bright, pure colorings which took their cue from the Couture quilts Denyse created for the showroom. She also created custom Jersey Stripe throws and 4 Crosses pillows in coordinating palettes.